The university offers fantastic opportunities, great graduation prospects, and an outstanding student experience. I’m glad I chose to study at NTU as I haven’t regretted my decision once! What made you choose to study BA (Hons) Fashion Design at NTU? "I have always known that I wanted to study Fashion Design, however finding the right place to study proved to be a difficult job. I found it quite hard to leave my home country and come to the UK, but after careful consideration I decided that NTU was the perfect place for me. The University offers fantastic opportunities, great employability prospects, and an outstanding student experience. I’m glad I chose NTU as I haven’t regretted my decision once!" "I think the most exciting part of this course is the fact that you get to explore a huge variety of areas within fashion design. It gives every student the chance to excel in the areas they really enjoy while also having the chance to improve on their weaknesses. During each project we have to be our own designers, illustrators, pattern cutters and manufacturers, stylists, and most of the time even photographers or models which provides us with an amazing range of skills. 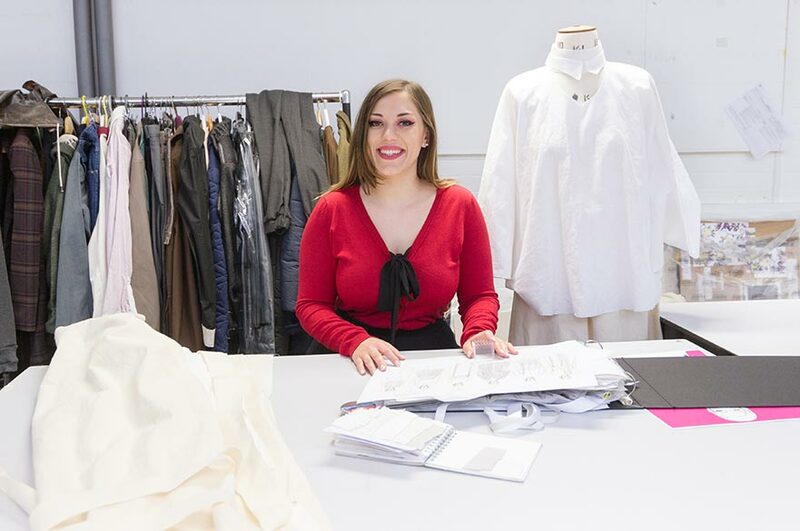 "In addition to this, I also love the fact that the course provides us with a realistic image of the fashion industry and not just the glamourous side of it. We learn about the downsides and the impact the industry has on the environment. It’s great that NTU is aiming to create a new generation of designers with a more sustainable approach to their work. If every university did this I think things would definitely start to change a little." How did it feel to be named the winner of the Young Ideas Fashion Illustration Competition? "Being chosen as the winner of this competition came as a huge surprise. As a fashion design student I am used to creating fashion illustrations for my own work incorporating my own designs, but I had never created any commercial illustrations. I found it quite challenging to find the right style, colours and poses to make an illustration that would attract customers. One of the most important things that I have learnt by entering this competition is that even if sometimes you don’t believe you can do something, still give it a try, you might surprise yourself!" "To experiment with lots of concepts and ideas and to be as creative as possible. Always seek new technologies, new concepts and interesting techniques. I’ve also learnt that it’s important to be aware of what’s happening around you because everything and anything can influence the way you design." "So far, I think that the most exciting guest speaker experience we have had was meeting the Japanese designer and creative pattern cutting master Shingo Sato. We had the opportunity to attend a lecture and a 6 hours workshop. He showed us a completely new way of achieving interesting shapes and volumes and we got to try out some of his techniques. It was a really good workshop and in only 6 hours he managed to give us a lot of different new ways of approaching our final major projects." "As every project starts with research, I think that the University library facilities are extremely helpful. The Vogue archive that we can access 24/7, the image data bases, and the wide range of books and journals are a great source of inspiration and knowledge. The fashion studios are also well-equipped and have everything you need to produce clothing items to a really high standard. Lastly, the Bonington art shop is probably a fashion design student’s best friend as it has pretty much everything you could ever need for drawing or even sewing your designs, while the gallery keeps us connected to the contemporary art world and gives us the chance to look at other people’s work and maybe even find some quick inspiration for our own." What do you like about studying and living in Nottingham? "Nottingham has something for everyone, from crazy nights out and concerts to nice and quiet cafes or parks, depending on your personality, there is always something to do. It is also an amazing place to socialize - I’ve found that making new friends here feels easier than anywhere else." "You will be challenged every day and its hard work, but seeing your designs on the catwalk at the end of each of your projects will make all the hard work worth it! You’ll experience a sense of achievement that you can’t find anywhere else, and you’ll graduate well prepared for life working in this exciting industry."